Draw 3D! free -- Paint, draw, sketch, or doodle in 3D. No glasses required! 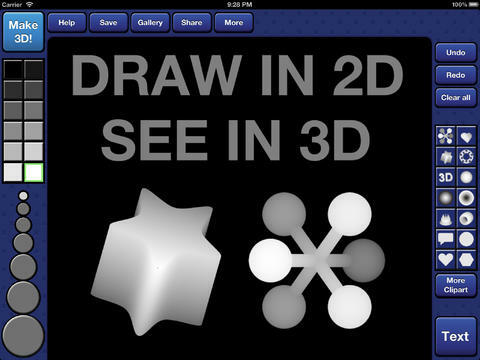 Draw 3D makes it easy to create your own hidden 3D images. 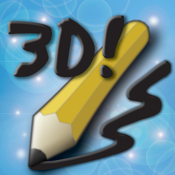 Simply draw something, then click a button to see your drawing in 3D! It's lots of fun for kids and adults alike. This app makes hidden 3D images called autostereograms from your drawings. At first these pictures seem like random patterns, but when you shift the focus of your eyes to a few inches behind the screen, the pattern comes alive with your 3D drawing! Thanks to this trick, your can see the image in true 3D without needing 3D glasses. A fun way to send hidden pictures and messages to friends. Share your drawings easily using Facebook, email, and Twitter. ★ Send secret messages to friends!